The JWRP trip ended last night but for the participants (and us City Leaders!) the JOURNEY has just begun! It was a transformative experience and I am looking forward the July trip! I can’t wait to see who gets to come with me then! Most of the 200 women went straight to the airport from our final banquet at Gavna. However, a few of us lucky ladies were able to stay in Israel another day or two, or Shabbat, or for me, almost a week!! So today Yael and I were able to attend the program marking the shloshim (30 days) of the 4 righteous men who were murdered in Har Nof. Thousands of women filled the rows at The Great Synagogue on King George Street. Mrs. Racheli Frankel was the first speaker. She lost her son Naftali this summer in the kidnapping and murder of the 3 boys.One of those boys was her 16 year old son. She is so beatutiful. She talked about the light of Chanukah and unity. What strength she has. What a role model for all of us. Then the young widow with 9 children of Rabbi Kupinski spoke. She talked about this being the first time she had to deal with the oil and the wicks on Chanukah. Her husband usually did that…but he is gone. She was such an inspiration. She spoke about serving Hashem not only when things are good and ideal in our eyes, but even when they are not ideal in our eyes. She was so honest and my heart goes out to her and her family. Chaya Levine spoke last. She is so down to earth. She spoke with the same authenticity as she did at the Women In Kiruv conference just a week before the massacre in Har Nof that took her husband of blessed memory. And she said that the Jewish Woman’s response to this tragedy is to ACT. That to respond with hate, violence or depression would be for the enemy to win. That instead, we can choose to improve ourselves one very small step at a time. She created the international movement called TAP where we each pick one small thing to work on. That small changes can bring BIG changes. She mentioned (or maybe it was Mrs. Kopinsky or Mrs. Frankel) that we are The Chosen People. And what immediately came to mind that we might be called The Chosen People, but what makes a person great is to be able to CHOOSE greatness. In every single step we take each day, we have free choice. We can choose life and growth or choose depression, blame and ultimatly bitterness. What is our choice going to be? What is yours? We went to do “chessed” today. Chessed is an act of kindness. One of the three things Judaims tells us the world stands on. (The other two are Torah and Prayer in case you were wondering.) So we went to a place called Seeach Sod, a special education organization for people ages newborn to 120 years!! The woman in charge there is SO CLEARLY fulfilling her purpose in the world by running this program. She was blessed with a child with severe physical, mental and behavioral disabilities, and what could have been seen as a dark part of her life, she chose to use as a torch not only for her own child and family but for many, many other children, people and families as well. We sang, and danced and made Chanukah art projects with a group of young women in their program. Our ladies were smiling ear to ear. We brought such amazing women on this trip and their beauty truly shined through today at Seeach Sod. Our next stop was Har Hertzl and Yad Vashem. If you have not been to either of these places, then you have not truly been to Israel. I remember where I was when Yizchak Rabin was assasinated. And standing by his tomb was chilling. Walking through the windy, narrow path in Yas Vashem, I was reminded by our fabulous tour guide that human beings ARE capable of such heinous acts. More importantly, however, if they are capable of such heinus acts, then they are also capable of HOLY acts. They tried to destroy us. They tried to extinguish our people. But look at us now! We have our Land and we have our People. It was an emotional yet inspiring day in many ways and it ended perfectly with a visit to an army base. A wonderful organization called Thank Israeli Soldiers does incredible work in making our IDF soldiers feel appreicated and loved. We brought care packages, and I brought cards from the children at Denver Academy of Torah which the ladies gave out and the soldiers absolutely loved. I call them “soldiers” but really, any one of those young women were the same age as my daughter and the young men were the same age as my nephew. They are not just soliders, they are our children. This week has been incredible. Tomorrow is our last day together. We came as 200 women. We will leave as 200 sisters. This is the first opportunity I have had to sit down and write down my experiences over the last three days! And what incredible days they have been. Friday morning I woke up to the news that the 15-yr-old son of one of my very dear friends did, in fact have cancer. They suspected it and were waiting on tests for a few days and Friday morning it was confirmed. So as we walked from the Prima Kings to the building where we would have our program that mornng I felt quite out of sorts and in a very surreal state of mind. Our first class on the idea of modesty was extremely grounding, however, and just what I needed. Something Nili said really struck me….A smart woman dressed in skimpy clothing is like a box of Cocoa Puffs with organic wheat germ inside! A person who wants Cocoa Puffs is not going to buy organic wheat germ, and person who wants organic wheat germ is not going to look in a box of Cocoa Puffs to find it! Enough said! While the class helped me to feel less shaky, I still felt so helpless, mainly because my friend was across the world dealing with this devestaing news, and I could not be there to hold her hand. You see, I was there about 9 years ago when her husband was in surgery to remove a cancerous tumor on a bone in his leg. People all over the word were praying for him and as I sat in the waiting room with her and one other friend, we prayed and prayed and prayed. But what happened next was nothing but a miracle! The doctor came out and said that he absolutey could not explain it, but that the tumor was GONE! It was no longer there. What they saw on the x-rays was not there! He had nothing to remove, closed him up and sent him to recovery! It was a MIRACLE!! So I knew the power of prayer was, well….POWERFUL! So I walked up to “The Challah Lady” who was about to teach her class and asked her if she could please ask the FOUR HUNDRED women in the room to pray for this boy, Raz Rachamim ben Avraham Avinu. I cannot tell you the comort it gave to know that so many women, THE FUTURE OF THE JEWISH PEOPLE were praying for him! Shabbos was in the air! Challah was made and we were off to the Shuk! Machane Yehuda is the place to be. I remember when I experienced my very first Friday in Israel 21 years ago. The way I aritculated it then still resonates with me. It seemed like everyone was running, simiar to the running we see in New York City. However, unlike the streets of NY, these people were running for SHABBAT!!! Its beautiful! But nothing is as beautiful than dancing with 400 of your sisters at the Kotel to welcome the Shabbat. And that is just what we did. We sang and danced and the circles around circles around circles were mezmorizing. A sight to be seen and an experience to be had. Women, young and old, religous and not-religious, civilians and soldiers, all singing as dancing as one. Dinner, dancing, words of inspiration…..
We spent our third meal of Shabbat with the holy young men of the Israel Defense Force. Meeting them and speaking to them was the highlight of Shabbat. These boys make me proud to be a Jew and proud that my 9-year-old son, my youngest child of five and my only son wants to be in the IDF when he grows up. Today was packed to the max and I should be sleeping due to exhaustion! A trip atop Masada where our sisters who were never privleged to receive a Jewish name were able to take one on for themselves. (Note to any women thinkng of going on JWRP trip…..BRING TISSUES!) The power of a Jewish name is hard to explain and is especially meaningful to me (see post https://chayaparkoffcoaching.wordpress.com/2013/08/) These women emerged from this naming ceremony anew.. This JWRP trip gives moms the opportunity to feel the Power of being of Jewish women and the chance to experience not only the body of Israel but her SOUL. It is said that it was in the merit of the Jewish WOMEN that we were redeemed from Egypt. And while we are no longer slaves in Egypt, we live in a time of great difficulty for the Jewish people. Dancing with these women tonight assured me that once again we will be redeemed and once again it will be in the merit of the Jewish women! And those Jewish women are YOU!!!! I Love You…NOT Like Chicken! I use the term “I love you” quite a lot. And I believe the people know what I mean when I say it. When the T-Mobile guys says he can send me a replacement phone for my broken one, I might shout “I love you!” Our course I don’t mean “I LOVE you.” What I mean is I that I am so happy that you met MY needs. What I REALLY love is ME, not YOU! Same with when I say “I just LOVE chicken!” I don’t LOVE chicken. Because if I really LOVED chicken, I would take care of it, not eat it! On the other hand, when I look in my childs eyes after he has just had a temper tantrum, I am able to say with all sincerity, “I love you,” THAT is real love. 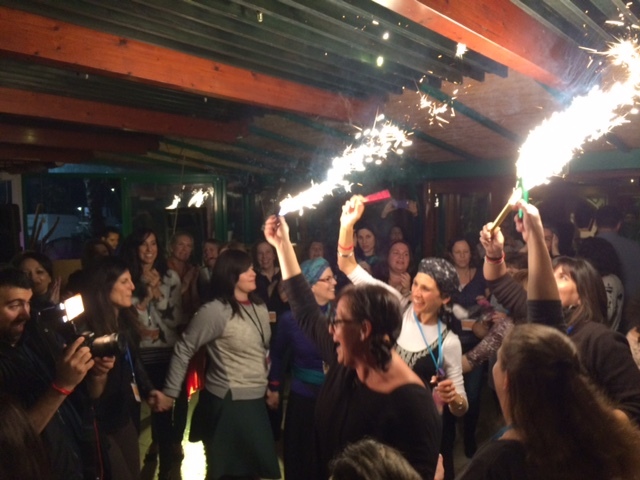 There are so many amazing women on this trip and here in Israel. We all look so different on the outside, and we learned yesterday some pearls of Torah wisdom that explains our differences in personalities, desires, preferences and paradigms. Yet we have so much common ground. Our “spiritual DNA” bonds us as sisters. One of the ladies from my city, Denver, is SO FUNNY! And I heard myself say “I love you…but not like chicken!” And another has such an amazing positive attitude. Despite tripping at the airport and having a bruised knee, she has be able to rise to the occasion and enjoy our busy schedule, always with a smile on her face. “I love you! But not like chicken!” I said to her! There is a real love amongst us. A unity amongst us. The Jewish people were redeemed from Egypt because of the WOMEN. And once again we will be redeemed. I can feel it! Can YOU feel the MOMENTUM? Blogging With My Eyes Closed! I am so tired, but I just can’t go to sleep until I express in writing the power of Day 2. Besides, I decided that I’ll sleep in the Next World. There is way too much to do here and now! We began the day with an insightful, inspiring, not to mention hilarious talk “The Kabbalah of Love and Marriage” by Nilli Couzens. I heard this talk many years ago as a young(er!) wife and new(er) mother, and as I heard it again I felt so grateful that I received that gift then and that the 200 women in the room were getting it now! Timeless wisdom that can bring our marriages to a level of holiness. We headed to Sfat for a day of spiritual melting. We learned about the spiritual ability every Jewish woman has to “Let It G0,” yand the “It” is ANYTHING and EVERYTHING that might be holding us back from joy. Fear, anger, worry, guilt… Judaism gives us a venue to release us from the shackles of the past and to embrace the HOPE for the future. OK. I am more awake now! Just writing about it invigorates me! And the ladies who led our tours today were so beautiful, radiant, elegant and incredibly down to earth and COOL! We saw these qualities in them, and I could tell that many of the women on the trip began to feel those qualities in themselves….perhaps for the first time…..or in a very long time. We spent time shopping, roaming the streets of Sfat and met up at The Red Hahn Restaurant, the OLDEST standing building in Sfat! I think they said it was 900 years. The women were drumming and singing and we ate and danced and sang, and felt as if we were catapolted into another dimesion. Already Have To Switch My Wrist! I didn’t even make it 12 hours, but I was aware (even as I was complaining) that I was doing it, and I tried to do it in a less whiny way…but I still complained. So my band is now on my left wrist and I am on Day One again! BUT I AM HOPEFUL!!! Why?????? My colleague, mentor, roommate, dear friend and Partner In Crime, Ellyn Hutt told me that on a prior trip a hotel front desk staff person told her that he noticed something VERY different about the JWRP women…..They were APPRECIATIVE AND HARDLY EVER COMPLAINED!!! We learned last night that when God gave speech He gave it in ten parts. Women got NINE of them and things that go roar, moo, bow wow, meow and Men got ONE! NOTE TO SELF: Use my words wisely! Now I Know What Movie Stars Feel Like! POPARAZZI!!! Now I know what it feels like and I can cross walking along the Red Carpet at the Academy Awards off of my bucket list! You see, It doesn’t take too long to find out that JWRP does EVERYTHING in style! After a long day of traveling we arrived in Israel with tons of excitement in the air! 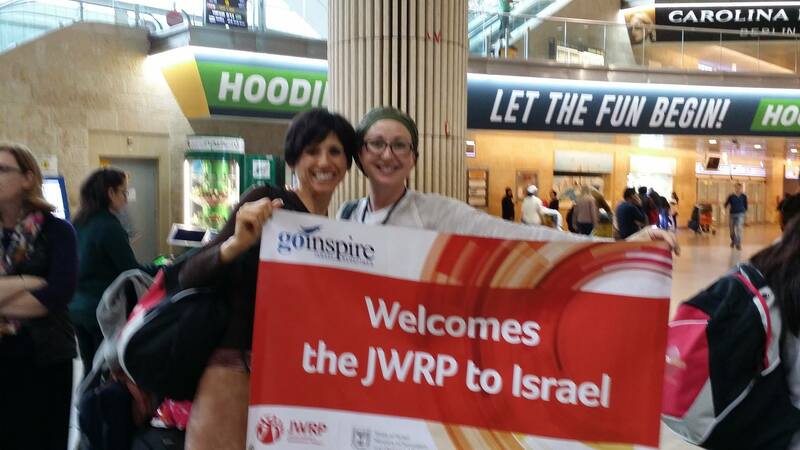 My Denver friend and Director of Recruitment for JWRP, Ariella Milobsky was there to greet us with a huge smile and a huge banner (and a gorgeous scarf wrapped around her head!) We took a group picture and loaded our buses for our first stop, Tiberias! After settling in to our rooms we were addressed by our Trip Director, the ZIPPY Tzippy Lieberman and then an inspiring talk from JWRP Founder, Lori Palatnik. 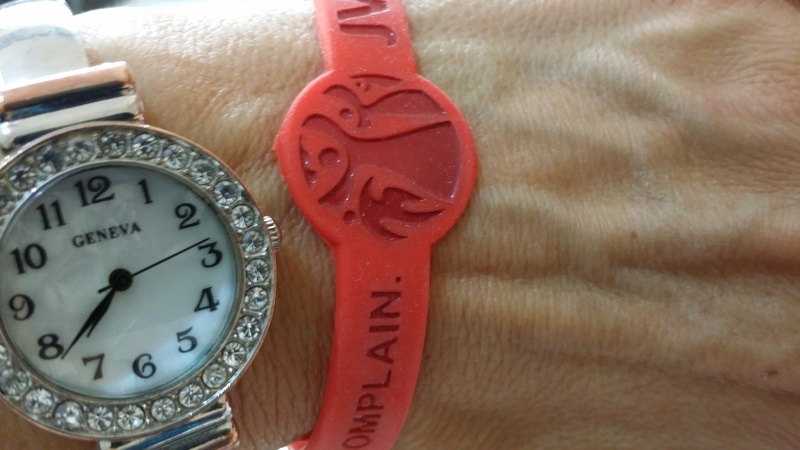 Lori challenged us all to raising the bar with JWRP’s campaign “DON’T BLAME DONT COMPLAIN” So now I am sporting a wrist band that I will switch from wrist to wrist each time I catch myself complaining or blaming! The goal is to get to 3 weeks without switching wrists! So far so good…but then again it is hard to complain when you are surrounded by 200 Jewish women from United States and Israel, and role models like Lori Palatnik and Nilli Couzens! And it is hard to complain when you are treated to an incredible dinner on the Kineret. I have seriously NEVER tasted salmon as delicous as I did tonight! Red Carpet treatment for sure. But it was the DANCING and the POPARAZZI that blew me away!!! Seriously…there were photographers and videographers EVERYWHERE. The lights were low, the music was loud and the dancing was through the roof! I TOTALLY felt like a movie star….but this movie is MY LIFE and the star is ME! And this is the case for each and every woman on this trip. Almost all of us are moms and we wear many other hats as well. And this trip is the time when we get to connect with ourselves, our Jewish souls and soul sisters and our Homeland. This is the mission of JWRP. Bring it on! Can you feel the MOMENTUM???? ?